Socialist Realist Painting, Mathew Cullern Bown, Yale University Press, 1998, No. 281, ilustrated p. 255. Sergei Grigoriev is one of the leading Ukranian painters of the Soviet period along with Tatiana Yablonskaya. This painting is a 1951 version of his famous painting Admission into Komsomol of 1949 which is in the Museum of Ukranian Art in Kiev. Admission into Kosomol, Kiev Museum. Kosomol or VLKSM was the All-Union Lenin Communist Union of Youth, a political youth organisation. It was created during the First All-Russian Congress of Worker and Peasant Youth of October 29th, 1918, with the aim of involving the worker youth in the communist struggle at early age. 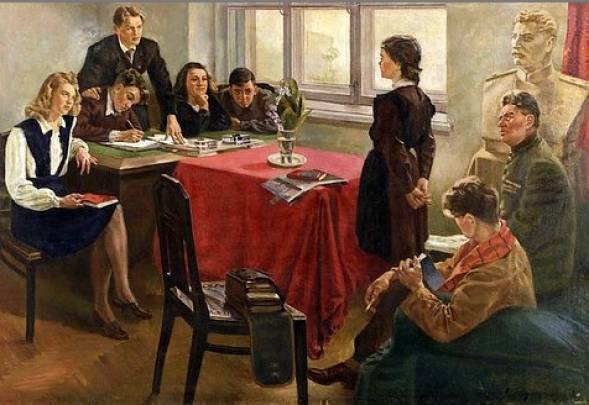 In Admission to Komsomol a young girl, standing upright in her finest outfit, is applying for membership and stands in front of the Komsomol Committee. A senior member of the military, WWII medals strung across his chest, sits behind her listening in whilst a portrait bust of Stalin looks on. Entering Komsomol was an important step for the youth of the 1950's if they wanted a political career. This painting is one of the most Russian famous artworks of the 1950's and with The Goalkeeper of 1949 established Grigoriev's reputation. 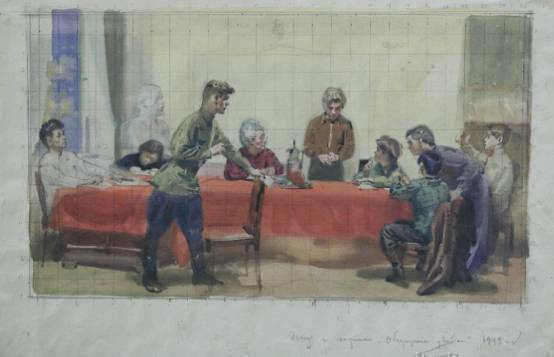 Part of the reason for the success of the painting, apart from Grigoriev's sure handling of paint and composition, was that many people remembered their Komsomol years as the happiest of their bleak post WWII existence. Grigoriev made numerous studies for the series of paintings he executed on this theme at that date. A preparatory study of 1949 for Discussion of a low Mark squared off for transfer. Sergei Grigoriev was born in Lugansk, Ukraine in 1910. He studied at the Zaporozhe Arts and Crafts School from 1923-26, then at Moscow VKHUTEMAS 1926-27: Kiev Art Institute 1928-32. He was active in Kharkov, Ukraine, 1932-34 before moving on to Kiev, Ukraine, thereafter. Began exhibiting 1932? Important shows include ‘Twenty Years of the Workers’ and Peasants’ Red Army’, Moscow, 1938; ‘Industry of Socialsm’, Moscow, 1939; ‘All Union Art Exhibition’, Moscow, 1947, 1949, 1950, 1951 and 1955. He was known as a leading painter of everyday-life genre subjects of the late 1940’s-early 1950’s. Well known works includethe already discussed Admission into the Komsomol (1949; Kiev Museum of Ukrainian Art); The Goalkeeper (1949; Tretyakov Gallery); Discussion of the Low Mark (1950; Tretyakov Gallery); He’s come back (1954; Tretyakov Gallery). He taught at the Kharkov Art Institute 1933-34; at the Kiev Art Institute from 1934; head of creative studios of USSR Academy of Arts, Kiev, from 1962. Became a Soviet academician 1953/54? Awarded Stalin Prizes 1950, 1951; President of the Kiev Arts Academy from 1958 and awarded the title ‘People’s Artist of the USSR’ 1974. Also a graphic artist. He died 04/09/1988. This painting is a famous Soviet painting and was much loved in Russia. Such well received paintings were copied by other artists and there is a possibility that this painting is such a copy. The Tretyakov curators maintain that it is never possible to know 100% and such a judgement has to made on based on the quality of execution. The fluent signature, the confident handling of paint and the similar technique to the painting in the Kiev Gallery lean towards this being a version by Grigoriev himself.